New Delhi, India -- Even the Buddha would not have thought that his preaching would disappear from the land of its origin, which happened after the 11th century. He would not have foreseen that the path of life preached by him, would be revived by an untouchable, 2,500 years after his mahaparinibban (death). Interestingly, the Buddha seemed to be the only Enlightened Being who took birth as an untouchable. 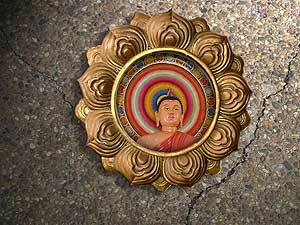 The Buddhist text, Jataka, is replete with tales of previous births of Buddha where he is an untouchable. In Matanga Jataka, Lord Buddha takes birth as a Chandala¹s son, Matanga. One day, Matanga goes to Benaras, and Dittha-Mangalika, daughter of a Benaras merchant, upon seeing him cries hoarse that a Chandala has entered Benaras. The people around beat Matanga till he becomes senseless. After he regains consciousness, Matanga realises that people beat him up for no reason because of the act of the Dittha-Mangalika, and resolves that he will not budge till he gets her. He lay at the door of her father¹s house for seven days, his resolve immutable. On the seventh day, the merchant brings out the girl and hands her over to Matanga. Matanga goes to the forest and in seven days he develops eight attainments and five supernatural faculties. He returns to the city of Benaras, fills the kingdom of Kashi with light, breaks through the moon, is worshipped by a great crowd and turns towards the Chandala village. So goes the story. In another Jataka, Chitta Sambhuta Jataka, the great being, born as an untouchable named Chitta goes with his cousin Sambutha to Takshashila, by camouflaging their caste to learn. But in an incident, the two men by mistake start speaking in a dialect of untouchables. The Brahmins get to know about this and beat both of them. They both turn into ascetics. This being the relationship between untouchability and Buddhism, Ambedkar took to Buddhism, after announcing in 1935 that ³I was born a Hindu, but I will not die as a Hindu². To mark the golden jubilee of the mass religious conversion of Ambedkarites, there was a grand congregation this year at Deeksha Bhoomi, Nagpur. This event is an annual feature, observed on Asoka Vijaya Dashami Day (Dussehra for Hindus), which fell on October 2. On that day, Nagpur bowed to an estimated 20 lakh Dalit Buddhists who came to Deeksha Bhoomi and the stupa to have a glimpse of the casket where Ambedkar¹s ashes are placed. They were joined by western and South East Asian scholars, monks and Dalit diaspora. The Western Buddhist Order, Birmingham, UK, celebrated the event in September in London as 50 years of Dhamma Revolution. Sadly enough, Indian television, which scours for stories to pack each minute of air time, lost the golden opportunity to bring this unique event into the public domain. It did not report a minute of it. Is it a case of marked indifference? Buddhism in India has a predominantly Dalit following, as a result of the revival by Ambedkar. For this reason, it appears that our society prefers to treat Buddha as an untouchable. In 2005, this event, which attracted an estimated 10 lakh people to Nagpur, escaped the national media attention. Dalai Lama¹s meeting with the first lady of California, US, would make news, but a 20 lakh Dalit congregation to celebrate Buddhism, would not. TV viewers were reminded daily of the significance of the 10-day Durga Puja, attended by Oxbridge graduates who seem oblivious to happenings elsewhere. October 2, 2006 was also the day of Gandhigiri for urban filmgoers. For the hordes of illiterate, but empowered Dalits in Nagpur, Gandhigiri would not have made any difference, because the Mahatma chose the path of change of heart of Indian society to address the sufferings of untouchables. Dalits are still waiting for that Ohriday parivartan¹ to happen.